You're the first to know...about our EPIC announcement! When we announce a new product, we want you—our loyal customers and OptoBlog readers—to be the first to hear about it. And this isn't just one product. This is EPIC: the world's first Edge Programmable Industrial Control system—a brand-new I/O and control system built for the future of automation and designed for the way you work. 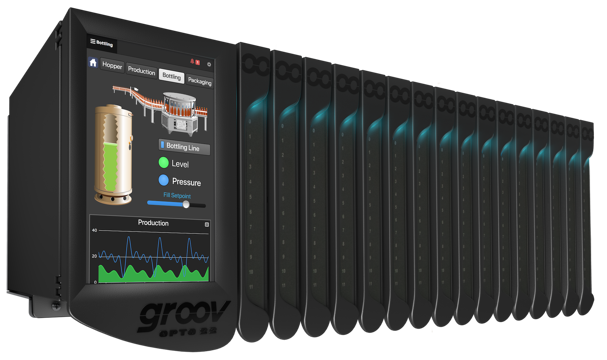 It all comes together to make groov EPIC your obvious choice for any industrial internet of things (IIoT) application. Or just about any application, since you know you can count on the quality of Opto 22 controllers and I/O. The groov EPIC system will start shipping in May 2018, and you can pre-order it in April! Here are some features you'll like. Get a sneak peek at the groov EPIC press release (official release will be Wednesday, February 14). The groov EPIC system will start shipping in May 2018, and you'll be able to place pre-orders beginning in April. So now's the time to plan for what you need. Remember that groov EPIC is fully compatible with the SNAP PAC System and uses the same PAC Control programming software plus the same groov View HMI software you may already be using with a groov Box or groov Server for Windows. For additional information and application advice, contact an Opto 22 pre-sales engineer: 951-695-3000 or toll free, 800-321-6786. Sign up now to stay informed on groov EPIC news. UPDATE: See parts and specs, and pre-order now!